Speak, Memory: Time Regained: From Slavery to Freedom: Peter Hope, Louisa Saunders and Frank Trigg, Jr.
From Slavery to Freedom: Peter Hope, Louisa Saunders and Frank Trigg, Jr.
Peter Hope (born 1776) -- hence, 94 years old, exactly the same age mentioned in Mary Louisa's letter. If only we could interview him: born the same year as the Declaration of Independence and still alive after the end of slavery in the USA! Who were his parents? How closely is he related to other family members? When did he die? Where is he buried? Louisa Saunders (born circa 1852) -- there's a married Louisa Saunders living in Lynchburg, Virginia, in 1880. Same questions for her as for Peter Hope. Frank Trigg (born circa 1850). Here we can say much more. 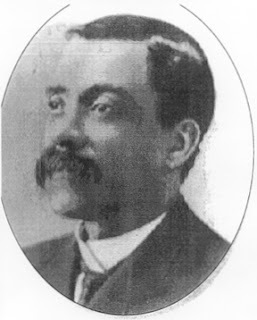 Frank Trigg, Jr. (1850-1933), was the son of Frank Trigg and Sarah Ann Trigg, who were also classified as mulatto. He married Ellen Preston Taylor (1858-1936) in 1880. The thing to look for now are his recollections of growing up, memoirs or other related documentation. 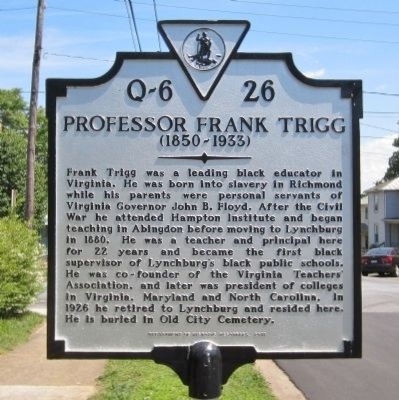 "Frank Trigg was a leading black educator in Virginia. He was born into slavery in Richmond while his parents were personal servants of Virginia Governor John B. Floyd. After the Civil War he attended Hampton Institute, and began teaching in Abingdon before moving to Lynchburg in 1880. He was a teacher and principal here for 22 years and became the first black supervisor of Lynchburg's black public schools. He was co-founder of the Virginia Teachers' Association, and later was president of colleges in Virginia, Maryland and North Carolina. In 1926 he retired to Lynchburg and resided here. He is buried in Old City Cemetery." Additional details from the Legacy Museum in Lynchburg: "Born a slave in Richmond, Frank Trigg received an education because he lost his arm in a farming accident and could no longer do farm work." Source: here. Note: Eliza Mary Johnston Hughes (1825-1909) was taken under the wings, for a time, of John Buchanan Floyd (1806-1863) and Sarah "Sally" Buchanan Preston Floyd (1802-1879). The "personal servants" of the Floyds seem to have been "bequeathed" in some way, formally, or informally, to Eliza, probably after the death of John. There may be legal documentation. Both Eliza and Sally Floyd were living in Abingdon in 1869 and socialized together, as evidenced in the letter from Mary Louisa Mitchell/Michel Binckley at Abingdon, Virginia, to John Milton Binckley at Washington City, dated August 8, 1869, mentioned at the beginning of this post. Much more to look for. Original manuscript of the Binckley letter is in the John Milton Binckley Papers, 1816-1943. Library of Congress Manuscript Division Washington, D.C. 20540 USA. This is my rough transcription.